BREATHING WELL: After 67 years with asthma, allergies and chronic bronchitis Kristine Sabbasen (84) from Tana could breathe normally. When Svein-Magne visited Vadsø in 2003, she was instantly healed during a corporate prayer at the beginning of the meeting. It was absolutely awful, Kristine Sabbasen replies briefly, when we ask her about what life with asthma was like. In fact, she had been living with asthma for nearly a lifetime. 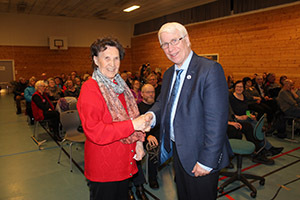 Throughout the 67 years she lived with pulmonary disease, until something happened during a meeting in Vadsø in 2003. She was 71 years of age at the time. -I was born in 1932, but when I was four years old I got asthma after a prolonged period with a cold. I developed chronic bronchitis and got asthma. Furthermore I had allergies. At that time there was no one who had experience with this. The adults smoked inside and it did not make the situation any better. In addition they sewed clothes of reindeer skins, which I was allergic to. The asthma led to heavy days with poor breathing. Eventually she moved to a boarding school where the indoor air quality was somewhat better, but every time she went home for a visit, she became worse. -The teacher was frightened by my condition, too many times I hardly had breath. I had to suffer through the days, and could not be very active. Eventually Christine was married, and in 1962 she moved to Berlevåg. Her husband was a fisherman and worked at sea, and Kristine was therefore often home alone with their three children. -Everyday life was terrible. I saw a doctor, but he said there was nothing they could do. There was not very much medication at the time. Many times I lay in bed in the morning. The children often had to fend for themselves. I readied breakfast the night before, but when they were older, they learned to arrange the food themselves. In 1972, a doctor came home to the family, because one of the girls had fallen ill. When he saw Kristines condition, she was referred to a lung specialist in the town of Kirkenes. There she finally got medicines for the chronic bronchitis and asthma. -You definitely have asthma, the doctor said. -When I used the asthma spray for the first time, I felt my lungs opening up. It was a new existense. Life was now better, but I did not get well. I also got some swelling in the body from medicines, which was not good, says Kristine. With new medication it was easier to live. She still depended on the asthma spray, and the allergies were still challenging. -Once on New Year's Eve in Oslo in 1983 we were visiting some friends. They had a big dog. I was very sick, but said nothing. Through the evening, I still became so sick that I had to be transported to the hospital by ambulance. I was admitted there for a few days where I was connected to a medical ventilator. In 2002 Kristine was asked if she wanted to attend a Christian healing meeting with Svein-Magne Pedersen in the town of Vadsø. She had never heard about this evangelist, but still went along as a chauffeur. -I see there are many sick people here, and not everyone can bear to be here all night. Therefore, I will pray a corporate prayer for all now at the beginning of the meeting. -I did not think much about the situation, but eventually I noticed that my breathing had become so healthy. It was strange because usually I would get so congested when there were many people around me. I had the inhaler in my purse, but I did not need to use it. I decided to still receive prayer from Pedersen. The wait was long for Kristine and her friends. At half past two in the morning the others wanted to go home. -Now that you have gotten me to come here, I will not leave until I have received prayer, just sit down and wait, she said determined. Four hours later, it was their turn. It was then 5:30 in the morning and there were only about twelve people left. Pedersen prayed a quick prayer for all of them. -My friend had such hip pain that I had to help her up to the front, but after the prayer she was healed. That's why it was smart that we remained until the end. Pedersen also prayed for me, but I was already healed. When Kristine came home, her family and friends were very surprised. The children were startled. "Mom, you've become so healthy, " they said. Both the asthma and the bronchitis have disappeared and I have not used drugs since. The allergies are also gone. Some time later I visited someone with a big dog, but I did not get any reactions. Kristine also went to see the doctor, who delighted in her healing. He had experienced similar stuff with previous patients. The doctor could confirm that she was healthy. -As long as you're healthy, I'm happy. It's all the same for me how it happened, he said. -God is wonderful and I thank Him that I have been able to breathe normally for the last 13 years of my life, Kristine concludes.